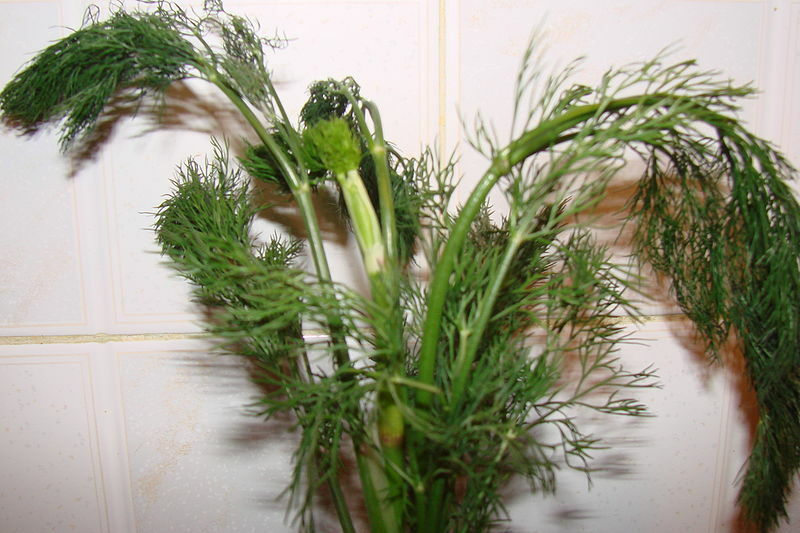 Dill (Anethum graveolens) is a popular pickling herb with an impressive historical pedigree. Its uses date back to the bible. That lanky, fernlike, yellow flowered plant you see in the produce department of your grocery store was once so valuable that it was kept under lock and key. And even though its monetary value has plummeted over the centuries, its appeal hasn't. Once an important herb in witchcraft, and a purported aphrodisiac, dill has a distinctive sour flavor that makes an interesting and sometimes unexpected statement in cooking. The leaves, seeds, and flowers of the plant can all be used. An annual that grows to five feet high (dwarf varieties come in at between two and three feet), dill likes full sun and a sheltered location. It prefers well-drained soil that has been amended with manure. 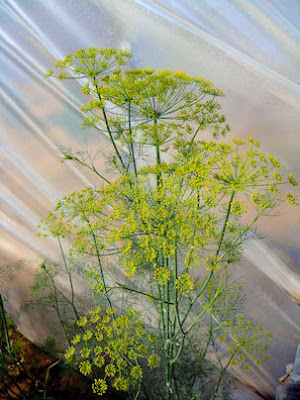 In the garden, it looks like fennel but shouldn't be planted near it as the plants will cross-pollinate. The result is unappealing. Dill gets spindly after a month or so, and even a light wind will topple it. Keep it in a protected spot, and tie it to a stick or post if starts to list sideways. 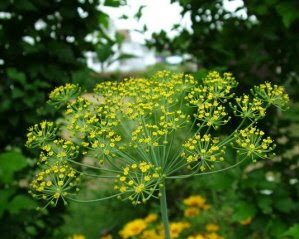 In midsummer, dill will produce wispy clusters of fragrant yellow flowers. If you want a larger harvest of leaves, keep pinching the flowers back to encourage leaf production. One small problem with growing dill in a hot climate is its inclination to bolt. Putting on a burst of growth and flowering out means few if any more leaves, which can be a bad thing from a harvesting prospective. If you want to keep your plants in leaf longer, check out my post about delaying flowering: How to Keep Your Plants From Bolting. Dill seeds readily, and one plant produces a good crop of seeds that will stay viable for years. You can plant seeds directly outdoors, but be sure to keep them well watered. Thin dill seedlings to about 12 inches apart. Dill can thrive indoors for a season if you can situate it in a sunny window. The plant will be a little smaller in overall size than its outdoor brother, but will be as flavorful nonetheless. It will still get leggy as it grows, but keeping it trimmed back a bit will help it maintain a pleasing shape. Most of the plant can be used, with the possible exception of the stem. Depending on the part you are using, there is a big difference in the intensity of the flavor. Using Dill Leaves - The leaves are least flavorful, so use them in the highest concentrations in egg dishes, with fish, cheese spreads and on vegetables. Using Dill Flowers - The flowering tops of dill have more flavor than the seeds and make a good addition to the pickle jar. Instead of just pickling gherkins this year, try a colorful vegetable medley. 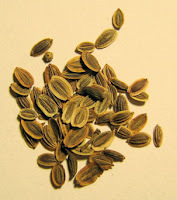 Using Dill Seeds - Dill seeds provide the strongest flavor by far. Used whole or ground, they are a good accompaniment to soups, fish, and vegetables. They can also be used to make a unique herb bread, flavored vinegar, and can even be added in small quantities to desserts, particularly those containing apples. Medicinal Uses for Dill - A tea made from a tablespoon of dill seed can help cure indigestion and treat hiccups. It has also been used successfully to treat colic (at 1/3 concentration) and to stimulate milk production in lactating women. Save any remainder and soak your fingers in it to help strengthen your nails. Dill may not be the most beautiful plant growing in the garden. It looks a bit weedy, and doesn't have the good sense to stand up straight, but it is a useful herb, and looks aren't everything. Dill self seeds readily. If you live in a temperate climate, it will come back year after year. Cucumbers marinated in dill vinegar are a delicious accompaniment to a summer meal. If you feel that your navy bean soup lacks punch, try adding a pinch of dried dill to spice up the flavor. Great information on the herbs and Flowers, I'll be visiting often as I just started an herb garden.Love the blog! This blog is excellent. i have learned a lot of interesting facts about the plants i have growing. thanks so much. It's my pleasure. Thanks for commenting. I've read that dill and fennel will cross pollinate and the results are less than tasty. Has that ever happened to you? I've always kept mine separate but would definitely put them in the same patch if I thought it would work out. Sounds about right. German potato salad particularly is a guilty pleasure of mine. my friend planted dill and purple flowers came from a few of the plants. have you ever heard of this happening? I'm not familiar with a purple dill, but someone else here may be able to help. Excellent and very helpful thank you!